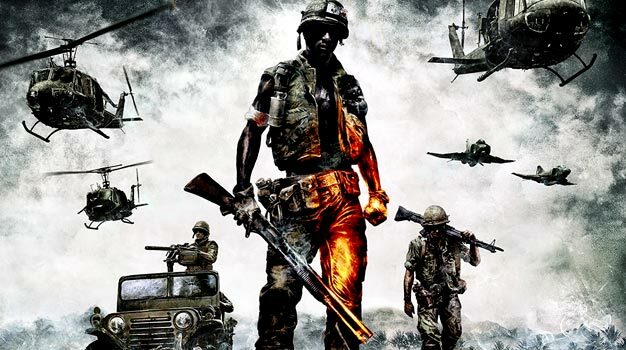 DICE have really taken the phrase “war is hell” to a new, literal level with their Vietnam expansion to Battlefield: Bad Company 2. It’s not often you stop to marvel at the scenery of a multiplayer title but I couldn’t help but lend a few seconds to gawking at the scorched hills of the map I was playing on, flames victoriously dancing about the place. It’s a stunning scene although perhaps it works better as a new guerrilla warfare tactic; it wasn’t long before a sniper bullet clipped me round the head while I stood there. The Vietnam DLC boils down to a bunch of new maps, vehicles and weapons for the game’s familiar classes. Instead of the modern combat you’ve come to expect from Bad Company 2 you’ll be handed slower, less advanced weaponry and sent forth into the tropical jungles to do battle. It is of course a nod to their brilliant BF Vietnam game and – judging by our time with the game – should match the standard expected of the franchise. I played two matches of the game’s Rush mode; once attacking, once defending. As with any Bad Company 2 match you’ll have your work cut out for you if you’re attacking. This map is a desperate uphill struggle to the two objectives on the map that you must destroy. The defenders have a trench system waiting at the top to rain down a hail of bullets from. It’s certainly intense to gradually make your way up a hill while your squad mates are being picked off, but DICE has thrown you a bone or two here. You’ll be able to weave round and find a few spots that overlook the trenches making for a perfect bit of sniping. This is just one example of Vietnam’s design promoting well thought out tactics. And tactics is exactly what you’ll need when you’ve got nothing but an M1 to fight off your enemy with. Vietnam’s weapons have a heavier weight to them, making it a bit more of a challenge to line up your sights and fire off a few rounds. It won’t be as simple as fitting a red dot sight to your gun and firing away; you’ll need to be a bit more confident in your short before your start firing. Reloading is a bit more work too, making for a slower paced, but arguably even more intense game than what you’re used to with Bad Company 2. The setting plays a big part in the action too. The lush jungles are filled with sights to see that are also deceptive hiding spots. The large bushes make for great spots to hide and pick off unsuspecting foes and it’s easy to lose enemy fire by weaving through the trees and rocks. It took a few lives or running in and getting gunned down to work out a strategy to the map. While attacking I managed to duck and dodge enough bullets until I found a spot with a nice view of the enemy camp. Instead of rushing in, I lined up a few shots, took them, then flanked round and down into the trench. From here enemies were almost always facing away from me so picking them off with a knife was easy. I eventually worked my way down to one of the objectives and armed it ready to blow. Having done that I returned to my happy little spot and defended with area from afar until the objective blew up. It just proved that with the perfect mix of timing and patience you can really turn and game of Bad Company 2 around by yourself which is what makes it so great. There’s still plenty we want to see out of Vietnam; the other maps, weapons and of course we’d like to get to grips with the new vehicles. But what we’ve seen so far we like.